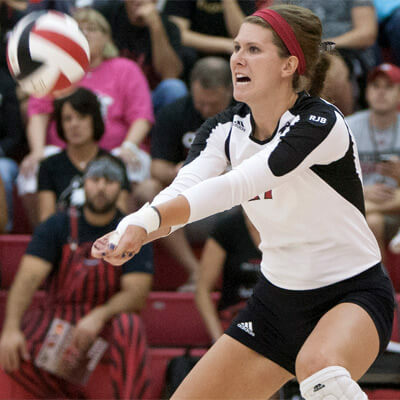 The Northern Illinois University volleyball team earned a big non-conference road win Tuesday in Cedar Falls, Iowa, with a 3-0 sweep of the Northern Iowa Panthers. With the win, the Huskies (4-3) earned their first win over UNI since 1998, ending a 10-match losing streak. The victory was also the first for NIU in Cedar Falls in their sixth try, along with being the first for NIU head coach Ray Gooden against the Panthers. “It was a great team win,” Gooden said. “We played a storied program in Northern Iowa who we are fortunate to play against on a regular basis. We’re appreciative to get the opportunity to play such a strong program. NIU found its groove offensively from the start, shooting out to a 10-3 lead behind kills from Lauren Zielinski (Oak Forest, Ill./Marist), Mary Grace Kelly (Strongsville, Ohio/Walsh Jesuit) and Jenna Radtke coupled an early ace from Alexis Gonzalez (Fresno, Calif./Bullard). Coupled with some unforced Panther errors, the Huskies kept firing to extend the lead all the way to 19-10, only for host UNI to rally to within 21-20 of the Huskies. With the Panthers primed to tie up the set, Mackenzie Roddy (San Bernardino, Calif./Cajon) and Shelby Seurer (Delano, Minn./Delano) came through with a big block, sparking a 4-1 run by NIU to close out the set. UNI set the tone early in the second half with an early 5-1 lead, but two Panther errors and kills from Roddy and Radtke (Buffalo Grove, Ill./Stevenson) quickly tied things up. The Panthers again built a four-point edge at 14-10, only to have the Huskies rally behind Roddy and Zielinski spikes. The two sides traded points until the Huskies moved ahead, 22-21, following a Roddy kill and a UNI error. The Panthers retook the lead at 23-22 and held set point at 24-23, but consecutive kills from Zielinski, Emily Paschke (Winfield, Ill./West Chicago Communiity) and Kelly gave the Huskies a 26-24 second set triumph. The two sides traded points to open the third until Radtke’s back-to-back kills opened up an 8-5 NIU lead. UNI closed the gap, but three-straight Roddy spikes gave the Huskies a commanding 11-8 lead. However, the Panthers clawed back and took a 19-18 lead following a 5-1 run. NIU and UNI went back-and-forth until the Huskies made the deciding move. Trailing 23-22, Seurer tied things with a kill, while Anna Brereton (Sun Prairie, Wis./Sun Prairie) put NIU at match point before Kelly got the match-winning spike. 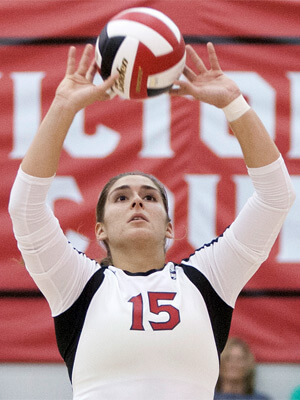 Kelly and Roddy powered the NIU offense with 12 and 11 kills, respectively, while Gonzalez posted 37 assists. On defense, Brereton registered 37 digs and Radtke tallied three blocks. The Huskies travel south to Kentucky this weekend to face No. 15 Arizona State, Louisville and Morehead State in the MSU Invitational. NIU takes on the nationally-ranked Sun Devils and host Eagles Friday before closing out the tournament against the UL Cardinals.